From safari-inspired soft luggage for business trips to luxury everyday work bags for men and women, our range of clever, versatile, and classic business bags and satchels are suited to the modern professional, safari-goer, and traveller. You will need a smaller safari bag to take with you on all safari activities - whether a few hours or a few days - including game drive safaris, walking safaris, horse riding safaris, mountain biking safaris, boating safaris, fishing safaris, canoeing safaris, and mekoro (dugout) safaris. Into this smaller safari bag will go any number of safari essentials such as sunscreen, sunglasses, insect repellent, binoculars, waterproof jacket (assuming you are wearing your warm-layer safari jacket or fleece), a safari beanie, any books you want to take on safari with you, water bottle, perhaps your passport if you prefer to keep it with you - and any other personal effects you want to take with you on safari. The nature of your safari will determine which bag - or bags - you decide to take with you on your safari. For example, if you are only planning on going on game drives, then you will be fine to take any safari satchel, safari backpack, safari tote, or over-the-shoulder safari bag as you will just be walking with it from your room to the safari 4x4 and then placing it on the seat next to you. If you also want to do walks from the lodge (recommended), then you would need a safari satchel or safari backpack and, if you are on a proper walking safari, then you would need a safari satchel or safari backpack which you are happy to have over the shoulder or on your back for many kilometres or miles of walking. Your choice of smaller safari bag (or bags) could and should also double as your safari carry-on bag for flights to and from Africa. If you prefer a larger carry-on to carry some clothes, then take this bag in addition to your carry-on. 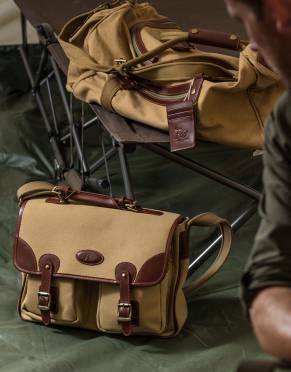 Some brands of holdall/duffel luggage - such as the Mara&Meru™ Voyager range - also allow you to zip and lock the ideal safari satchel-backpack combination bag as an end pocket on to your main safari bag, which means that you simply unzip it when you get to your safari to use it as your smaller safari bag. That way you are able to check it into the aircraft hold for your international flight to Africa. 1 x smaller safari bag per person.